There are now so many electric vehicles in Norway that state authorities will soon run out of the special “EL” license plates made to identify them. 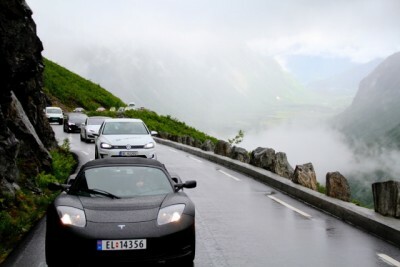 A second series of plates is due to be introduced as electric car owners and fans gathered in the fjord town of Geiranger this weekend, to celebrate at an electric vehicle festival and join forces to protect their interests. Another 17,000 electric vehicles (EV, called el-biler in Norway) have been registered in Norway so far this year, according to new numbers from the state vehicle council OFV (Opplysningsrådet for Veitrafikken). With sales expected to hit 25,000 in 2015, the total number of electric vehicles on the road is expected to rise to as many as 70,000 by the end of the year, according to Norsk elbilforening (The Norwegian EV Association). According to an estimate recently reported by website arstechnica.com (external link), one of every three cars now sold in Norway is electric, even though the country still relies on its recently troubled oil industry. The national EV association has been encouraging all Norwegian EV owners to make the trip to Geiranger, ironically just as a disaster movie about a huge wave hitting the area was premiering in cinemas all over the country. The EV industry is far from disaster, though, and can instead celebrate a wave of popularity that if anything has only threatened to eliminate some of the EV owners’ benefits sheerly because their numbers have grown so large that politicians have argued over whether EV incentives are still necessary. 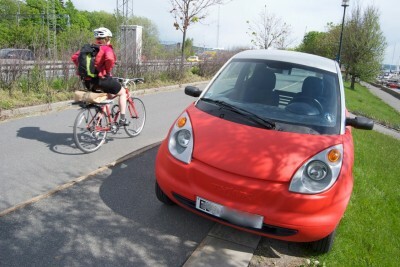 Norwegian policy has figured heavily into charging up the industry, since current incentives that so far have survived intact make electric cars exempt from tolls, many taxes and other fees, still allow their presence in public transport lanes and include free parking and charging facilities in addition to other benefits. The Norwegian EV Association has been fighting to preserve those benefits and rallying its members to do so as well. Organizers of the weekend festival said it will feature most of the electric available in Norway today, from the Renault Twizy and best-seller Volkswagen e-Golf to the Tesla Roadster Model S. The oldest EV in Norway, a Waverly Electric built in 1902, was also due to be on display at the headquarters for the festival, the Hotel Union, which organizers wrote as “HotEL” in a press release. “We acknowledge that individuals may have different reasons to choose an EV,” they added, “but we are all pioneers and promoters of a reality without noise and exhaust.” The association represents around 23,000 of the roughly 60,000 EVs now on the road. That’s because the sale of electric vehicles is expected to remain brisk, meaning that the second phase of license plates is likely to run out as well. “Therefore we’re planning ahead,” Heidi Øwre of Statens vegvesen told Aftenposten. Both “EK” and “EV” have been set aside for future electric cars, she said, and the authorities have a preference for alphabetical order.